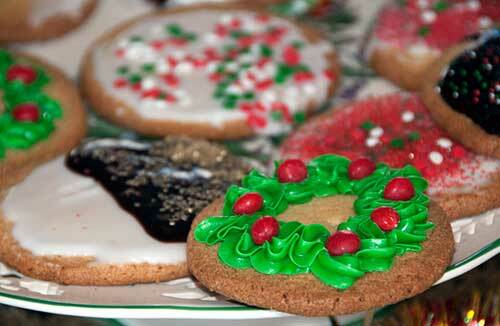 Remember when you were a kid and loved those delicious sugar cookies with all the fun decorations? Well, now you can make them with our Gluten-Free Toasted Oat flour and this recipe! These classic sugar cookies are sure to please a crowd. Make them up for your kids’ school, an office party, or just to have tasty gluten-free sugar cookies for Christmas with your eggnog! Celebrate the Christmas season with these classic gluten-free sugar cookies. Combine sugar and butter in a stand mixer until creamy, scraping down the sides as needed to fully incorporate. Add egg yolks and vanilla. Continue to mix until fully combined, scraping down the bowl as needed. Add the gluten-free flour blend a half cup at a time on slow speed until fully combined. The dough will be slightly stiff. Place dough on a sheet of parchment paper. Roll the parchment over the dough and form a tube of dough. Twist the ends of the parchment to help form the dough into a nice, tight tube. Tightly wrap the tube in a sheet of plastic wrap and refrigerate for at least 2 hours or until firm. Remove plastic from dough and cut into quarter-inch rounds and place on a cookie sheet lined with parchment paper. Place cookie rounds about 2 inches apart on the sheet. Bake for 13 minutes in a convection oven or for 15 minutes in a standard oven. Watch the end of the cooking time carefully so you don’t burn the cookies! The edges should lightly browned, and the center should be light yellow. Let stand on cookie sheet for a couple minutes, then allow them to fully cool on a cooling rack. Decorate as you see fit! Great sugar cookies recipe. I have seen different cookies recipe in many websites. But, this is the great.